This is one of the racks for our new office at Southcreek. It has two 48-port HP switches and fewer than 10 ports are free since we completed our moves yesterday. On the shelf below the patch panel is our SonicWall firewall and DSL modem. These provide a backup (a VERY slow backup) for our wireless LAN bridge. No problem Clif … it looks pretty good :-)Are those 1 foot cats ? Yes. Ian, our network admin, prior to coming on our staff worked for 3 years for a company that did voice and data cabling. This is one of his tricks. 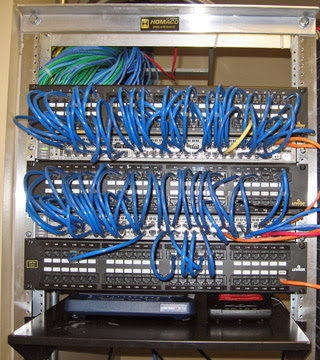 The traditional method is to stack up patch panels with cable management between each panel, separately stack up switches, and then run 3 or 6 foot cables between panel jacks and switch ports. Instead of this, Ian’s method is to take out the cable management and put the switches right next to the panels. And then, you guessed it, he uses 1 foot patch cables. Simple, cheap, and very neat! It looks real slick when you have 48-port 1U patch panels like these ones. You can pack a LOT of ports into a rack that way. I came across your blog by searching for Neatpatch for which I was searching a Distributor in europe – finally I must say that your “trick” will help me to save a lot more money, than with Neatpach panels.